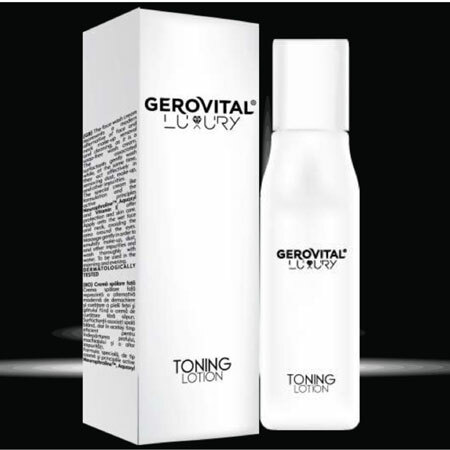 The Gerovital Luxury Toning Lotion contains a selected blend of ingredients with an instant toning action which leaves skin energized and revitalized. Essential to any skincare routine, it refreshes and tones the skin after cleansing and preps it to better receive products to follow. Sepitonic M3®, a cocktail of mineral salts, stimulates cellular metabolism and speeds up skin’s regeneration. It protects the dermis and improves cellular communication, revitalizes and energizes the skin, working as a bioenergizer for clear, fresh complexion. Niacinamide, a derivative of Vitamin B3, is a valuable skin-restoring ingredient which prevents skin from losing water content, stimulates microcirculation in the dermis, improves skin tonus and protects from further UV damage. Usage: Apply morning and evening, after cleansing. Pour desired amount onto cotton pad and sweep gently over face and neck, avoiding the eye area. Ideal for starting out or ending the day, it can also be applied whenever you need to refresh or invigorate your skin. Apply morning and evening, after cleansing. Pour desired amount onto cotton pad and sweep gently over face and neck, avoiding the eye area. Ideal for starting out or ending the day, it can also be applied whenever you need to refresh or invigorate your skin. INGREDIENTS: AQUA, PEG-6 CAPRYLIC / CAPRIC GLYCERIDES, PENTYLENE GLYCOL, GLYCERIN, PHENOXYETHANOL, NIACINAMIDE, SODIUM COCOAMPHOACETATE, ETHYLHEXYLGLYCERIN, DISODIUM EDTA, PROPANEDIOL, MAGNESIUM ASPARTATE, ZINC GLUCONATE, PARFUM, SODIUM CHLORIDE, TEPHROSIA PURPUREA SEED EXTRACT, BENZYL SALICYLATE, COPPER GLUCONATE.